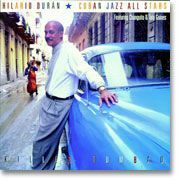 The listener who buys Killer Tumbao based on the title will be disappointed; this is not driving, salsified Latin jazz. Rather, it is a beautifully played jazz release that is alternately upbeat and introspective. Fans of sparkling piano playing will enjoy the clarity and facility displayed by Durán. Flautist/saxophonist Jane Bunnett, a leading promoter of Cuban jazz, is heard to good effect. The horn section cooks and the percussion mostly stays back in a supporting role; overall, the musicianship, arrangements, and production are first rate and enhance the leader's virtuosity.